New Rosé for the Bay, just in time for Earth Day! Baykeeper is supporting newly proposed state legislation that would protect San Francisco Bay—and all of California's coastline and waterways—from a new threat of oil spills. In a surprise policy shift, the federal administration announced in January that it was going to open almost all US coastal waters to offshore oil drilling. Oil drilling off the California coast risks a major oil spill in coastal waters, which could threaten San Francisco Bay, local shorelines, and sensitive wildlife. Plus, some of the oil would likely be transported across the Bay to local refineries, increasing the risk of an oil spill in the Bay. Senate Bill 834 and Assembly Bill 1775 would ban new pipelines, piers, wharves, and other oil infrastructure that would facilitate the transport of oil drilled under federal offshore leases. By placing limits on the oil industry's Bay Area infrastructure, the legislation would help protect the Bay from any increase in oil tanker traffic, and oil spills, that might result from new offshore oil drilling in federal waters. Learn more about Baykeeper's advocacy for legislation to protect the Bay from offshore oil drilling. In a major setback for protecting the health of California's waterways, the Delta Tunnels plan took a big step forward this week. The Metropolitan Water District of Southern California, which provides water to the cities of Los Angeles and San Diego, voted to pay for the majority of the project. Lack of funding was a significant hurdle that, until recently, appeared likely to derail the Delta Tunnels project, officially known as "California WaterFix." This proposed multi-billion dollar infrastructure project would divert more water from the Sacramento River to Southern California cities and Central Valley farms. If the Delta Tunnels are built, there will be less fresh water flowing through the Delta and San Francisco Bay, which are already starved for fresh water. There are many proven, lower cost methods to increase California's water supply and make water use more efficient—while also keeping freshwater flowing in our rivers. Opposition to the tunnels remains strong. Baykeeper and our environmental partners will continue to fight to protect fresh water flows for the health of San Francisco Bay and the Sacramento-San Joaquin Delta. 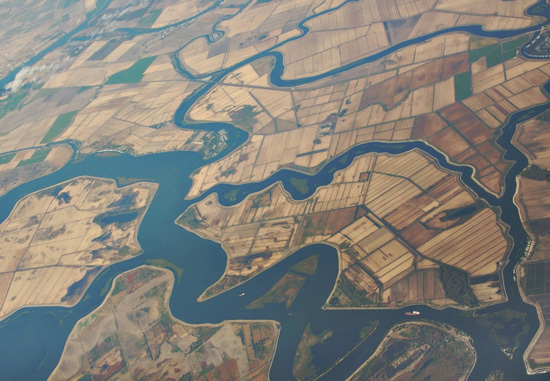 Read the San Francisco Chronicle's report about the Metropolitan Water District of Southern California's decision to fund the Delta Tunnels. A lot of the trash that accumulates along Bay Area highways and freeways ends up San Francisco Bay. Trash pollution blights Bay views, inhibits recreation, and harms wildlife. Caltrans, the state highway agency that's responsible for maintaining clean roadways, is not doing enough to fix this problem. Caltrans has failed to take even basic steps to monitor trash and get it cleaned up. Baykeeper and our partners recently advocated for stronger enforcement of Caltrans' trash reductions. And regulators have agreed to require Caltrans to do more to stop trash from entering the Bay. Bay Area cities also need to be more effective in curbing trash pollution that's washing into the Bay. We're putting pressure on cities, as well as Caltrans, to make sure trash doesn't harm the Bay environment. 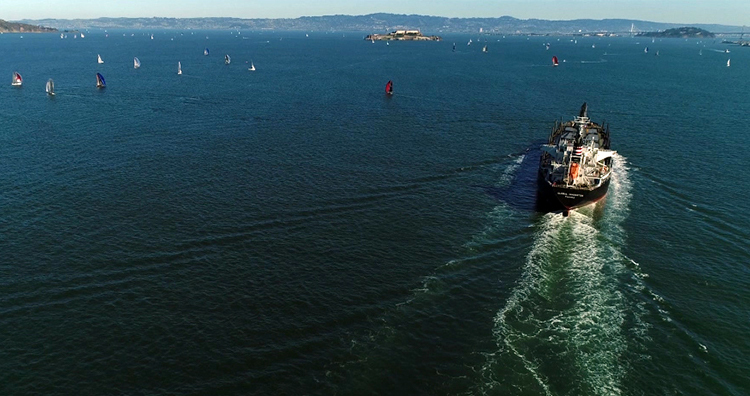 Read more about Baykeeper's advocacy to stop trash from flowing into San Francisco Bay. The city of San Francisco is moving tens of thousands of tons of sand from one end of Ocean Beach to replenish a badly-eroded part of the beach further south. The city has pledged to spend millions to mitigate coastal erosion. But there's one major factor contributing to the loss of sand at Ocean Beach that San Francisco hasn't acknowledged: commercial sand mining in San Francisco Bay. Baykeeper has been fighting since 2012 to reduce Bay sand mining, to protect habitat and prevent shoreline erosion. Ocean Beach has the highest rate of beach erosion in the state. Scientists have demonstrated that sand flowing through the Bay would naturally replenish coastal shorelines like Ocean Beach—if it weren't being scooped up by sand miners. Despite this evidence, the state agency overseeing sand mining contracts approved a 50% increase in the amount of sand that could be harvested from the Bay over the objections of the state Coastal Commission. So Baykeeper is challenging the legality of increased sand mining in court. If San Francisco really wants a long-term solution for Ocean Beach's erosion problem, city officials should oppose selling off this vital public resource. 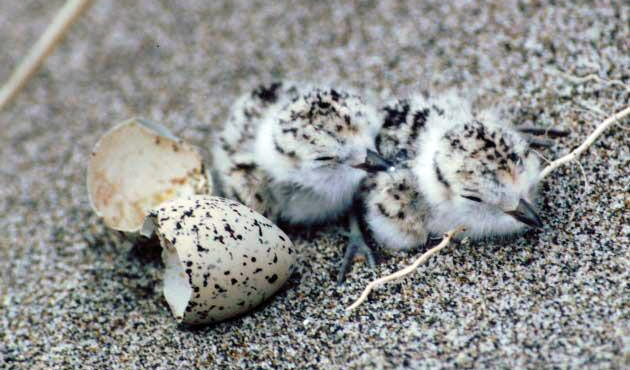 Pictured above: Snowy Plovers are listed as threatened under the Endangered Species Act, and coastal erosion puts their habitat at risk. Read more about Baykeeper's work to stop excessive sand mining harming Ocean Beach. April 22 is Earth Day, and this year's theme is ending plastic pollution. 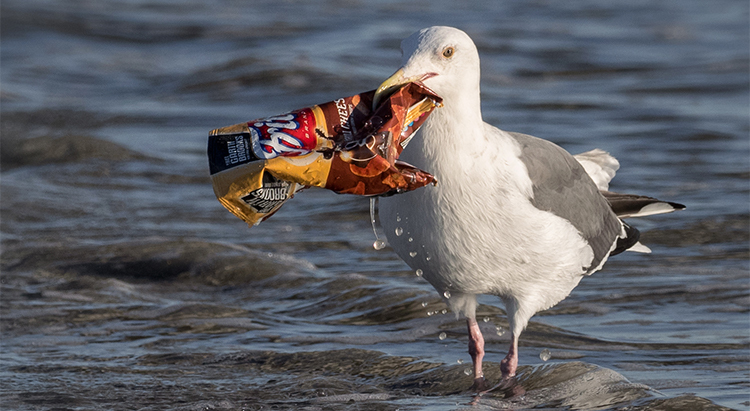 You can help by taking action to reduce the plastic trash that ends up in San Francisco Bay and the ocean. Before you buy something, ask yourself if you can get the same product without plastic. This includes plastic packaging. Avoid, or even boycott, items excessively wrapped in plastic. When you order a drink at a restaurant, request that it not include a straw. Plastic straws are a big contributor to plastic pollution. Don't use disposable dishes, glasses, and utensils. And Baykeeper invites you to celebrate Earth Day 2018 with us at upcoming events for this world-wide day of action for a healthier environment. Saturday, April 14 – Marine Science Institute's Earth Day on the Bay in Redwood City features activities for kids and adults. Stop by Baykeeper's table! More info. Saturday, April 14 – Berkeley Bay Festival includes hands-on educational activities, live music, and more. Kids can Make a Bay Fish at Baykeeper's table. More info. 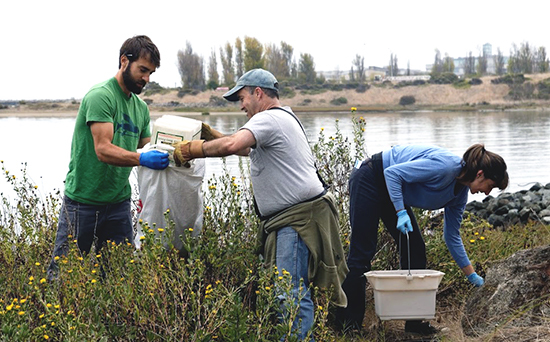 Saturday, April 21 – Oakland Estuary Shoreline and On-the-Water Cleanup, co-hosted by Baykeeper and Mary Spicer Life Solutions. Help remove trash on foot, or aboard a stand up paddleboard or kayak. California Canoe and Kayak will offer discount rentals for participants. More info. Sunday, April 22 – Taste of Science Lecture Series: Life on Earth. Baykeeper Staff Scientist Ian Wren will talk about sea level rise and San Francisco Bay at the "Taste of Science" series on Earth Day! The event will feature four speakers at Laughing Monk Brewing in San Francisco. Tickets are $5 or $7 at the door. More info and register. Saturday, May 5 – Crissy Field East Beach Cleanup & After Party with Sports Basement. Help keep trash and cigarette butts out of the Bay. Lunch is provided for volunteers. More info. Learn more about celebrating Earth Day with Baykeeper. Every year, Obsidian Wine Co. crafts a special pinot noir rosé especially for San Francisco Baykeeper, with 100% of the proceeds supporting our work. You can enjoy the new 2017 Rosé for the Bay knowing that your full purchase goes toward keeping San Francisco Bay safe and healthy. You can pre-order Rosé for the Bay now. The wine will be officially released on Earth Day, April 22. Obsidian will also be offering a sneak peek of the 2017 Rosé for the Bay in their tasting room in Sonoma on April 14 and 15. Bottling is on a first come, first serve basis, so order soon—last year's vintage sold out in just three weeks! 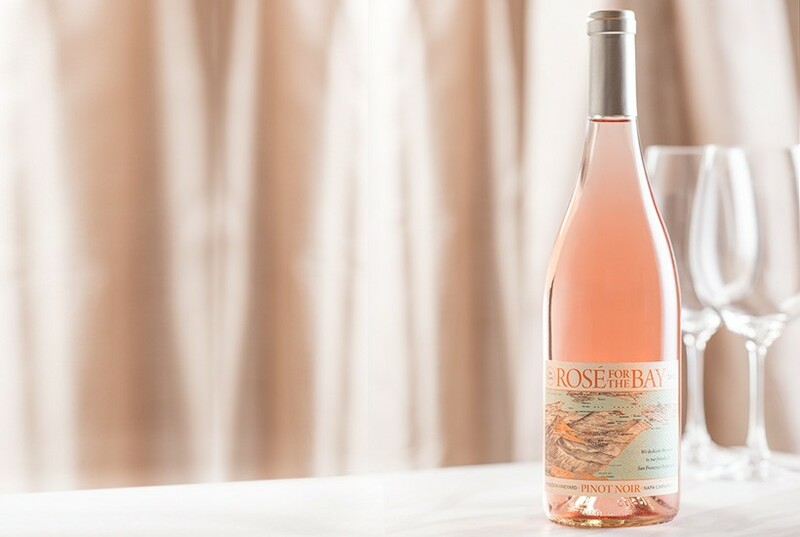 Click here to pre-order the 2017 Rosé for the Bay from Obsidian Wine. A squatter sailboat has been towed from Aquatic Park after a long struggle to get it removed. The boat had illegally taken up residence in the cove without a permit, and Baykeeper received reports that the boater dumped raw sewage into the Bay. Baykeeper had been monitoring the boat and working with regulatory agencies to resolve the problem since it was first reported to our pollution hotline in February. Last week, the boat was towed out of the cove after losing its anchor and getting tangled in the moorings of two historic ships nearby. Baykeeper is continuing our work on the larger issue of pollution caused by anchor-outs and abandoned boats around the Bay. During recent heavy rains, Baykeeper conducted new field visits to several industrial facilities to make sure polluted storm water wasn't running into the Bay. Baykeeper took photos and inspected flows to storm drains, and will be reviewing sampling data to check contamination levels. Our new aerial patrol program helps Baykeeper investigate different types of threats to the Bay—from abandoned boats to oil slicks to shorelines vulnerable to sea level rise. Our volunteer drone pilot partners at Autonomous Imagery recently helped us document the path that oil tankers take across the Bay. The footage will allow us to map areas of the Bay likely to be impacted by an oil spill. Below is a still from the drone video of part of the oil tanker path, showing sailboats and a container ship on the Bay.